It was nice night for a walk among the lights. Everyone used to arrive right across the street, at the old train station, coming from the countryside to their jobs in the city, and on the other side of Calle 44 there were bars and brothels awaiting their arrival. The old train station, closed in 1961 after debt mounted and other means of transportation became available, is now the Edificio Antiguo Ferrocarril, a national monument home to little cafes and shops. There are still bars nearby, yes, although maybe not as many, and I haven’t noticed any brothels. What you do see, in the park between the Biblioteca EPM and Pasaje Carabobo, is a cluster of tubes that reach 20 meters high. 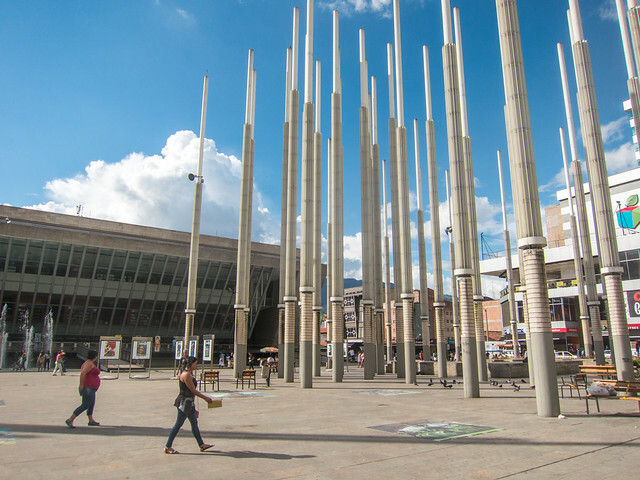 They are lights, 300 of them, hence the name of the park, Parque de Las Luces, and they were part of an improvement project that proves progress never ends in the city of Medellín. This park is less than 10 years old, unveiled in 2005 to clean up the Plaza de Cisneros, a landmark in this southwest section of downtown once riddled with drug addicts and homeless people and now welcoming to residents and visitors. Just try not to go too late at night. It can still be dangerous. But a stroll past the area just after it gets dark can be a real treat if the lights are on, a schedule I have yet to figure out, although December, when Medellín boasts its alumbrado, or Christmas lights display, is a good bet for some bright nights in the park. No need for the lights at this hour. It was a brilliant sunny day for a stroll through the city. I was lucky enough this past Saturday, after walking back to Calle 44, also known as the San Juan, to see the lights. I had completed a stroll downtown, starting at the Parque de Los Pies Descalzos, and was headed home to have a beer with some new friends, Chris from New Zealand and Joanna from Canada. My face lit up when I saw the lights. I immediately snapped a picture. Forgive me if it’s not a great one. I was excited. It was my first time ever walking through the park after dark, because I had always tried to keep my visits for the daytime hours. It was probably around 8:30 p.m. or so when I passed, and as we pulled away in the taxi, I took another photo, albeit one worse than the shot I took as I stood at the edge of the plaza. I felt pretty safe. If I didn’t, I wouldn’t have pulled out my camera. Of course, as I said earlier, it was only around 8:30, early enough that there were still a lot of people out and about, still having dinner or a few drinks with friends before heading home or to the next party location. I smiled again as I left. I like looking at progress.